During the twenty five years of experience our Delta Force Paintball staff has witnessed countless paintball games. They have seen it all, whether it be the trash talking corporate executives breaking into tears in the heat of combat, the team of ten year old paintball rookies taking down a whole team of men three times their age, to the hilarious stag and hen group antics in the manner of fancy dress ranging from bear costumes to bikinis. Paintball players of all shapes and sizes have crossed these battlefields and our staff have put together the ultimate team of paintball players; a team that fulfills all the skills and tactics needed to win during a day of paintballing at Delta Force. No matter the occasion, whether it’s Sunday League football, the local pub quiz or a night out with the girls, everyone knows that the best teams have a variety of characters all which contribute to the game and each bringing something unique and new. Paintball is no exception with the best teams made up of a variety of players all contributing different strengths and weaknesses to the game. It is important that your team comprises people who all add necessary skills and advantages to ensure a victorious win. This is the guy who doesn’t take orders from anyone! No carefully orchestrated battle plan can hold this guy back from doing what he wants to do. Being a guy or girl of few words, The Rambo Lone Ranger never issues commands nor listens to them. Despite not being a team player, The Rambo Lone Ranger’s alternative tactics and actions may just be what leads your team to victory. Paintball is a world where the term “moderation” is foreign along with cost factor and Rambo The Lone Ranger epitomizes this. These are the kind of people who immediately upgrade their gun to an M16, buy as many paintballs and pyrotechnics as they can carry and go out into the field of battle with enough ammunition and explosives for the whole team. They play like they have an angel watching over their shoulder and their ammunition will never run out. Despite Delta Force Paintball providing all players with full equipment, The Lone Ranger probably has a wardrobe full of camouflage ready for this very moment. He thinks he resembles Arnold Schwarzenegger and possesses Rambo’s physique, but that cheap tribal tattoo isn’t fooling anyone. Just by looking at our game zones at the end of the day, we can tell that a Rambo has passed through! Everyone knows this guy is good. A natural born leader. Even with little to no paintball experience under their belt, he or she still has the confidence to lead their team to victory through simple yet effective strategies. The Captain is a team player who volunteers for risky moves, shares their paintballs with teammates, mobilises the whole team to attack together like a well oiled machine and goes above and beyond the call of duty. With one of these guys on your side, you’re sure to dominate the enemy even if the opposition is looking to take them out as they move quickly around the game zones. They’re the kind of person you’d trust to carry you home after a few too many and not tell anyone about your accident on the way. The Captain is the core of every team. Now nobody would admit to being a coward, but every team has their share! They are the ones who never stray too far from the starting point, keep their heads down in the most well fortified bunkers for the whole game and claim to provide cover fire for the team, even though they are out of range! Often found to be hiding behind any obstacle whether they’re in the firing line or not. They won’t think twice about using their teammates as a shield and will ask a hundred questions a minute. Every group has one. However, having a group of cowards on your team can be useful as they can be left to protect the president or provide your team with a draw during a total annihilation game, as the enemy can’t find them! Most likely to: Return to basecamp with the majority of their ammo. These guys have been paintballing a lot. And by a lot, we mean A LOT. Their paintball careers may have had modest beginnings but after a few short years these guys know their stuff. They are geared up with all manner of streamlined, lightweight paintball clothing and their helmet looks like something from the future. Not only that, they are brimming with expert knowledge accrued from hundreds of battles! If you have one of these guys on your side, you can be sure to whitewash the opposing team! Most likely to: Tell you off for playing the game wrong. Chalk and cheese to that of The Pro, The Wannabe offers just the opposite. This guy is used to having a cheeky Nandos with the lads and updating his Instagram to all 65 of his followers. Upset at having to leave his phone back at base, The Wannabe has no interest in paintball tactics and shoots at everything and anything, He’ll claim he made 100 successful shots, when in reality he only managed two. This guy knows what he’s doing. He confidently yet quietly upgrades his paintball gun to the M16 (or sticks with the Inferno if he likes to play old school), buys a modest amount of paintballs and sits in a meditative state before the games start. During the games, this Sharpshooter is a godsend; he hits impossible targets, understands the wind resistance and trajectory of the shot and takes out enemies that nobody even sees. While mobility may not be the name of the game for The Sniper, they are valuable members of your team. Most likely to: Cause the most damage during the day. Used to having his or her own way, they’re the kind of person who won’t hesitate to throw their toys out of the pram. The Tantrum will be adamant their gun doesn’t work properly, or that someone isn’t sticking to the rules if their team is losing. Most likely to: Stamp their feet/huff/feign some excuse. Which one are you likely to be? 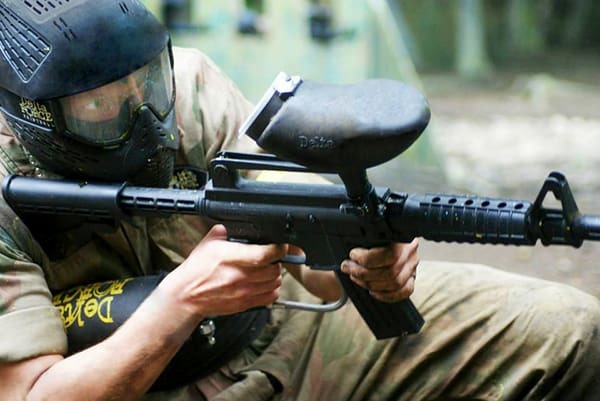 Book at any one of our 35 UK paintball centres by contacting an event coordinator 24/7 on 0203 869 9301 or alternatively you can use our online booking form.